Elizabeth Bishop is one of those poets few people know about, but there’s no particular reason she isn’t a household name. A writer who went on to earn international acclaim, she spent some of her childhood living with her grandparents in Great Village, NS. I’m not entirely sure why every Nova Scotian isn’t yelling her name from the rooftops, but Great Village is one place where Bishop is praised and raised proudly to the lips of many of the people I’ve talked to. I first became involved with the Elizabeth Bishop Society of Nova Scotia (EBSNS) three years ago when I entered their writing contest for the Elizabeth Bishop Centenary Festival, celebrating the poet’s 100th birthday in 2011. The contest revolved around the theme of home, an homage to the fact that Bishop’s own writing often reflected back to her childhood in Great Village. I was pleased and honoured to find out I was one of the winners of the contest, along with several others in different age categories. As a wee, shy fifteen-year-old, reading my short story at the festival in August 2011 was daunting, but there my love of reading to others took seed and began growing — plus I met Laurie Gunn and Sandra Barry of EBSNS, author Sheree Fitch, and took a poetry workshop with Anne Simpson. This time spent in Great Village among passionate poets and painters, along with other young writers, was the first big push in continuing the idea of turning my writing into a career (still entirely not sure how to do that, but heading that way nonetheless). 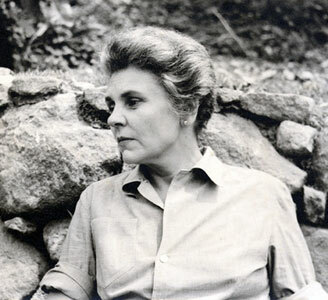 In 2013, the EBSNS published Echoes of Elizabeth Bishop, a collection of all the winning entries from the contest. The launch was once again an inspiring experience, and one of the first times I was able to see my work printed in a legitimate printed form you could, like, buy. When I got an email from the EBSNS inviting me to read at the new cafe, In the Village, of course I jumped at the opportunity. The afternoon featured several young artists (poets, painters, writers, and actresses) with a connection to Bishop: Maria Duynisveld, Laura Sharpe, April Sharpe, Anneke Stroink, and myself found ourselves at the microphone in St. James United Church. The talent I heard and saw today once again reminds me that I am far from alone in the prospering front of young artists. For Maria and I, this was a flashback to our participation in the Centenary Festival three years ago and a reflection of how we’ve changed since then; Maria shared this reflection in her reading. What the EBSNS has done for me and other young artists is remarkable. As I’ve written about in the past, I’m a strong advocate of supporting young writers and giving them the opportunity to have their work shared with the public and with other artists of a similar age. It’s hard being taken seriously, and the reward of seeing the genuine emotional impact our work has on others is what young artists need to keep pursing their goals, dreams, and talents. The importance of receiving such support is paramount to young people. They need to know their work is good, valued, accepted, and cherished, or someday they might stop doing what they love. Many people write or paint or act for themselves, but having the chance to be supported by those working and volunteering in the field, or even just as an enthusiastic patron of the arts, can be the difference between a hobby and a career. The support from those I’ve met as a result of my interaction with the EBSNS is some of the support that has done the most for me and my pursuance of my writing career. Thanks to the EBSNS, I’ve been published, had the opportunity to share my work multiple times, have met some truly wonderful, kind, supportive people, and have firmly established that I’m headed in the right direction. Merci beaucoup, mes amis! For more information about the EBSNS, Elizabeth Bishop, and Great Village, please check out these sites! The EBSNS sounds like an amazing organization, a wonderful legacy for a talented writer and a great support for you and other emerging writers. Had I been introduced to an organization like this when i was younger, I may have become a writer much sooner. Congratulations on having your work in print. It feels good doesn’t it. Everything I know about EBSNS is wonderful. It’s something I would like to be more involved in if I could find the time. I’m holding a writing/publishing workshop for teens this October — I love meeting and working with young writers. 🙂 Thank you, Darlene!